James Clark Ross discovered the position of the North Magnetic Pole on the Boothia Peninsula. Urbain Le Verrier presented to the French Academy calculations indicating the position, but not the mass or orbit, of a planet beyond Uranus. He placed Neptune within one degree of where it was found. Germany launched a V2 from Peenemunde to test the early cut-off mechanism and engine control. The engine burned for 62 seconds, total flight time was 287 seconds. The missile impacted 3 km left of the intended trajectory. S. Arend discovered asteroids #1592 Mathieu and #1593 Fagnes. As a rocket test stand improvement, the first experimental use was made at NACA Lewis Labs of a "boot-strap" rocket-exhaust powered ejector, to permit testing at simulated high-altitude conditions without complicated and expensive exhausting facilities. USSR launched Zenit-2 11F61 S/N 3 which suffered a Block B strap-on engine stage shutdown 1.8 seconds after liftoff. The booster crashed 300 m from the pad, and did enough damage to put the launch complex out of operation for a month. NASA launched X-15A ASAS, 23 alpha, M-5 test mission # 55 in which USAF Maj Robert M White reached a maximum speed of 5914 kph (Mach 5.42) and an altitude of 40.416 km, with the steepest reentry descent and highest angle of attack (27 degrees) to date. USSR launched the DS-MT #1 astronomy satellite from Kapustin Yar, but the booster suffered a first stage failure four seconds after launch. NASA launched the Gemini 9 Augmented Target Docking Adapter (ATDA). The Gemini 9 Augmented Target Docking Adapter (ATDA) was launched from Cape Canaveral using an Atlas-Agena D rocket on 1 June 1966. The spacecraft was successfully injected into a near-circular 304 km orbit (apogee 161.5, perigee 158.5 nautical miles), but telemetry signals indicated that the launch shroud, which covered the docking adaptor, had separated but had not been jettisoned. One hour and 40 minutes later, the scheduled launch of Gemini 9A was postponed by a ground equipment failure which prevented the transfer of updating information from the Cape Kennedy mission control center to the spacecraft computer. The mission was recycled for launch on 3 June, following a prepared 48 hour recycle plan. When Gemini 9A was launched two days later, the ATDA failure was confirmed when the astronauts observed the launch shroud still on the ATDA blocking the docking port, looking, according to Tom Stafford, like an "angry alligator." 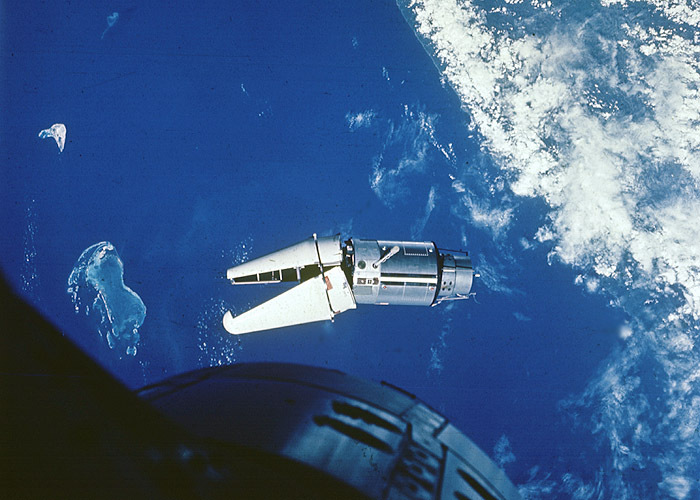 Rendezvous within 8 meters of the ATDA was achieved by Gemini 9 on the third revolution. The shroud had not jettisoned because the lanyards had been installed improperly with the loose ends taped down, due to "insufficiently detailed" instructions. Plans to cut the fiberglass shroud loose were considered but discarded as too dangerous to the astronauts. The flight plan was then revised, and Gemini 9 completed two different equiperiod rendezvous maneuvers with the ATDA. The ATDA was left in a 290 x 300 km orbit. The Augmented Target Docking Adapter had been prepared as a backup target in case of an Agena Target Vehicle failure. The ATDA was a short cylinder consisting of a target docking adapter cone mounted on front and containing a communications system, a guidance and control system, and a reaction control system. It also had running lights, but unlike the Gemini Agena Target Vehicles, the ATDA was not stabilized. NASA completed the download of pictures from the Lunar Obiter 4 probe in orbit around the Moon. NASA completed the Shuttle Phase A evaluations. * The common orbiter/booster engine planned would have to have a lower thrust than originally proposed, with more used per booster, due to the need for the orbiter to have several engines instead of one or two in order to give it abort capabilities in the event of a single engine failure. It was recommended that a 180,000 kgf engine be developed for the shuttle instead of the 230,000 kgf previously planned. * Lifting body configurations were not suited for the launch vehicle application, due to the required complex internal arrangement of tanks and equipment within the curving hull, difficulty of fabricating the airframe and tanks, and poor subsonic lift/drag performance. * Variable geometry wings were not desirable, since they resulted in a heavier weight to body area ratio during re-entry, and thereby, more re-entry heating problems. They also required complex mechanical and pneumatic/hydraulic systems for operation, which meant more maintenance, more complexity, and extra failure modes. Their considerable advantages - a lower spacecraft weight fraction and the highest lift/drag in subsonic flight - did not offset these disadvantages. * Two orbiter alternates were to be proposed by the contractors, one with a 370 km cross-range (NASA requirement), one with a 2784 km cross range (USAF requirement). This implied a minimum L/D for the high cross-range vehicle of 1.8, and a total heat load 5 to 7 times greater than the low cross-range alternative. * Seven-day orbital mission capability. * Go-around capability on landing in case of a missed approach, which implied use of airbreathing engines. Phase A studies showed that use of gaseous hydrogen from the orbiter's tanks as fuel for such engines drastically reduced the orbiter weight compared to use of conventional JP-4 jet fuel housed in separate tanks. USSR launched Soyuz 9 (called "Sokol" - "Falcon" in English) from Baikonur for acquisition of extensive observations on the effects of prolonged flight on both the crew and the spacecraft. Perth Observatory discovered asteroid #2167 Erin. H. Debehogne discovered asteroids #2543 Machado and #3411. USSR launched the Cosmos 1371 military communications satellite from Plesetsk to replace Cosmos 1140. The West German ROSAT extreme UV, X-ray telescope was launched into orbit from Cape Canaveral to perform an all-sky survey. The USSR Spektr module dock was docked with the Mir space station.